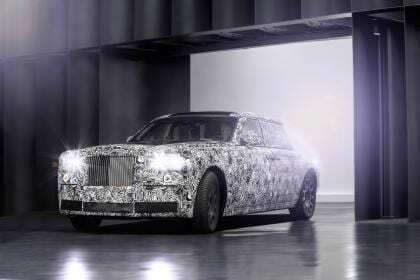 Rolls CEO confirms development cars on the road, with new platform for ‘Cullinan’ and next-gen Phantom. Rolls-Royce has already revealed it will be building its first SUV in 2018, but now the British luxury firm’s boss has confirmed testing of its new aluminium platform is underway. Dubbed ‘project Cullinan’ and likely to use the name for production, engineering mules of the SUV “will be assessed on public roads around the world”. The aluminium space-frame architecture will further underpin the next-generation of models, including a new Phantom. The testing phase will ensure the SUV still “delivers Rolls Royce’s trademark ‘magic-carpet’ ride on a variety of surfaces and that it is resilient to extreme weather conditions”. Speaking to Auto Express at the 2015 Frankfurt Motor Show, Rolls-Royce boss Torsten Muller-Otvos revealed that the upcoming Rolls-Royce SUV would be launched in the second half of 2018. He was confident about the progress being made on developing the brand’s first high-riding SUV model, although he prefers to call it an all terrain vehicle.